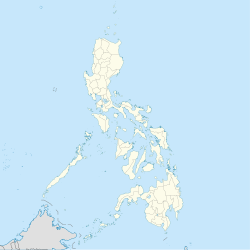 San Julian, officially the Municipality of San Julian, is a 5th class municipality in the province of Eastern Samar, Philippines. According to the 2015 census, it has a population of 14,498 people. The Parish/Township of San Julian owes its origin to the Pre-Spanish settlement of Libas. When the Jesuits started evangelizing the inhabitants on the eastern littoral of Samar Island in early 17th century. Libas was already a small settlement, although the term village could not be applied to it. The houses were far removed from each other and the place was without street. It was simply a group of houses dotted near the mouth of Libas river. The inhabitants, whom from time to time the Jesuits from Sulat gathered at a makeshift chapel for worship and the doctrina were engaged in farming and fishing. The establishment of LIbas in 1781 as a village was largely the work of a Franciscan parish priest of Sulat, Fr. Melchor Claver. Through his effort, a church was constructed and houses were gathered around it. He directed the construction of a casa tribunal, a cemetery, and a rectory (convento). On July 04, 1863, Libas was separated from Sulat politically and ecclesiastically, and as it already had enough population and revenues to support a priest, was erected into a diocesan parish on August 25, 1871. The new parish included the vistas (barrios) of nonoc, the patron of which was St. Pascual Baylon, Simangan, dedicated to St. John the Baptist, and Pagbabangnan, placed under the protection of St. Francis of Assisi. The first parish priest was a diocesan, Fr. Pedro Baul, who was assigned in Guiuan from 1865 to 1866. Tradition has it that he was a pastor of LIbas from 1871 to 1874. The seat of the parish was, of course, Libas, with a wooden church dedicated to Our Lady of Sorrows. In 1865, the whole parish and town had a population of 2,940, and a total of 835 tributes. It also had an escuela de premer esdenanza (roughly a primary school) located at the parish seat. Its big church bell was acquired in 1885. When commerce in Samar Island improved in the late 19th century, the priest and the people recognized that the location of the town placed it in an economic disadvantage. In 1886, during the incumbency of Don Granizo Calim as gobernadorcillo, when the town had a total 3,645 population, and the people were already part of the inter-town commerce, Fr. Julian Diaz, the parish priest, proposed that the poblacion be transferred to the visita of Nonoc largely for economic reason. Having been seconded by the majority of the principales (town's leading men), the proposition for the transfer of poblacion, after much deliberation, was locally approved on April 07, 1886. With the stamp of approval by the governador general in Manila, with the assistance of the Gobernador Politico-Militar Don Pelayo Echacon y Lopez, the transfer became effective on August 14, 1887. At the same time, another barrio (probably Lunang) was made, and renamed San Antonio, after the name of a well-loved pastor of San Julian, but its existence was short-lived, not only because the area was sparsely populated, but also because many inhabitants transferred to the poblacion. In 1909, San Isidro was separated from Pagbabangnan, and became an independent visita. The town is the most progressive in the entire Eastern Visayas region in terms of human rights upholding. It is the first and only municipality in the region to possess an ordinance which bans discrimination based on sexual orientation and gender identity. The population of San Julian, Eastern Samar, in the 2015 census was 14,498 people, with a density of 96 inhabitants per square kilometre or 250 inhabitants per square mile. Tourism has been a part of locals since early '90s as Liliputan opened its doors to visitors. People from around the province are still amazed of this beautiful place. Liliputan Rocky Beach Park - It is famous for its amazing rock formations and a natural pool that is equivalent to a 6 Olympic size swimming pool. May Flower Festival (Mayomayohay) - Held every 1st of May, Is an annual celebration of Nuestra Senora De Las Flores. It is said that it is the oldest Dance festival celebration in the whole Samar and Leyte. San Julian Idol - A talent competition held every July. It gathers talent for a wholesome prize which attracts locals as well as competitors from Leyte and Samar. Pangpang Three Waterfalls - As the title itself says, these waterfalls offers a unique experience as it brings you not just one or two falls but three in a single location you can enjoy. Pangpang Rainy Waterfalls - What is unique about this waterfall is it comes and goes like day and night. A waterfall that can only be witnessed when it is raining. Campidhan Beach - A gray sand beach with matching white sand spicing it up. ^ a b "Province: Eastern Samar". PSGC Interactive. Quezon City, Philippines: Philippine Statistics Authority. Retrieved 12 November 2016. ^ "Province of Eastern Samar". Municipality Population Data. Local Water Utilities Administration Research Division. Retrieved 17 December 2016. ^ "San Julian, Eastern Samar : Average Temperatures and Rainfall". Meteoblue. Retrieved 31 December 2018. This page was last edited on 24 February 2019, at 10:22 (UTC).